Explore the busy streets of Kathmandu. Walk the narrow and crowded ancient market of Asan. Try out a variety of Newari foods, sekuwa, and mo:mo’s of Kathmandu valley. And Annapurna Circuit Cycling and Biking Adventure let us drive on a snake road overlooking the loud rivers and scary ropeways. Enjoy the view of mountains from different distance and angles. Push and ride your bikes on the rocky jeep roads and jungles. Cross waterfalls, streams and bridges that will keep you awestruck. Explore the desert and rain shadow area of Nepal. Eat local and garden grown foods, which will be as fresh as you can get. Carry your bikes over the mountains and ride thrilling downhill off roads into the valleys. Explore the ancient Tibetian culture and Buddhist shrines. Get drunk on locally brewed alcohol and relax in hot spring. Enjoy the serenity of Pokhara and make new friends. explore the offerings of Pokhara. Make a memorable experience for a lifetime. This cycling adventure gives the opportunity to all the adventure seekers looking for something new in Nepal. 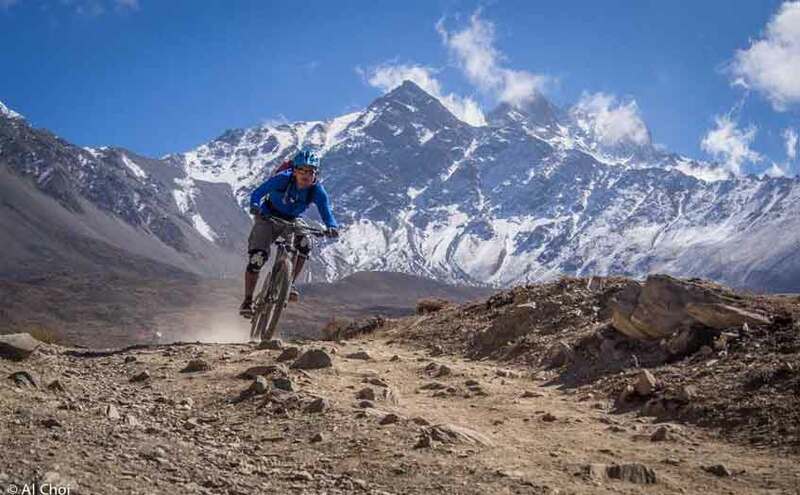 this trip will provide the riders to visit some of the popular destinations in the Annapurna circuit which were not accessible a few years ago on bikes. the construction of off-road on Annapurna circuit has given us chance to form this interesting travel packages as well as manage support resources for the long distance riders. the views of this trip are really incredible and riding in that environment is hard to experience in any part of the world. You will be picked up at Tribhuvan International Airport and transferred to your hotel. In the evening, you will involve in group introduction and trip briefing. This is the perfect time to ask any last-minute questions regarding what to expect on the upcoming trip. You will also be informed on packing and necessary information needed while travelling off-road in Nepal. Kathmandu altitude:1200m ASL Pro tip: You can explore the valley till the evening. Explore the busy narrow streets and old Newari settlements of Kathmandu. This way you can get to know basic Nepali culture and customs. You will be picked up at your hotel with all of your necessities. You will spend around 8 hours in the bus but it will be enjoyable nonetheless. You will be able to enjoy the beautiful sight of mid hills covered in greenery. The Prithivi highway moves along with the Trishuli river, famous for white water rafting, and Marysangdi. keep an eye out for suspension bridges, twin, and scaring looking ropeways along the way. The roads move with the curves of the hills so, road looks dangerous than it is. Just after entering Pokhara valley you will feel different atmosphere with amazing view. You will spend the night in a hotel in lakeside Pokhara. Pokhara altitude:1,600m ASL Kathmandu-Pokhara: 202 km Pro tip: try to get as much rest as possible this day. your body will be tired from the 8 hours of ride and you will have to ride the bike the next day. There are so many villages around Pokhara that most tourist are unknown about. You can use this day to get to off beat paths and villages of Pokhara. Bike along the shore lines of lakes in Pokhara. You will also come across many temples and local culture while travelling to less crowded areas of Pokhara. You will also get to test the bike if it was compatible with you. You will be able to adjust the bike specific to your needs. You will spend the night in the hotel in lakeside Pokhara. You should explore this village as it contains so much history. The Himalayan Rescue Association hosts a talk on hiking safety at altitude every day at 3 pm. This talk will be interesting and maybe lifesaving to attend. this will be the last stop to see a doctor or to get an altitude medicine, antibiotics and painkillers. take contact information from the clinic as they know most of the health problem people face in that altitude. You will spend the night in a hotel in Manang. Accommodations during the trek, on both fixed departure and private trip options, will be extremely basic, tea-houses and small lodges with sleeping and basic meal facilities. Modern amenities are usually absent, as is the hallmark of remote mountainous areas. 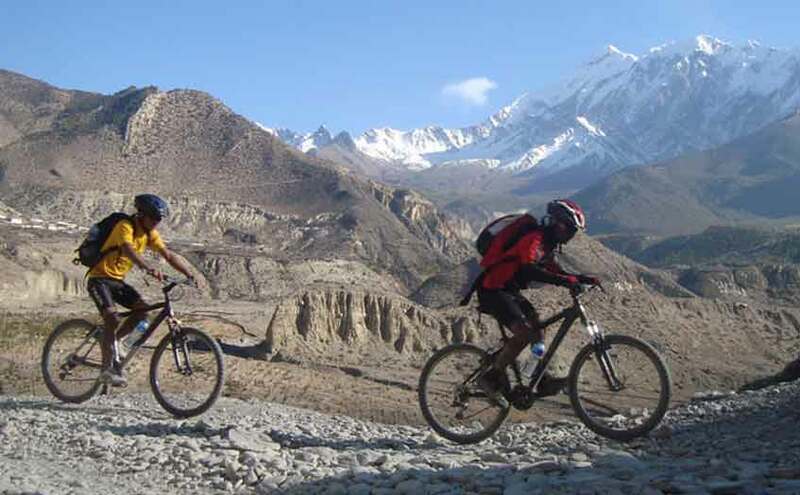 annapurna circuit cycling adventure (16 days) has a 5-star physical rating. please click here to know more about the physical ratings of our trips.